Summon: This lane becomes Dementia. 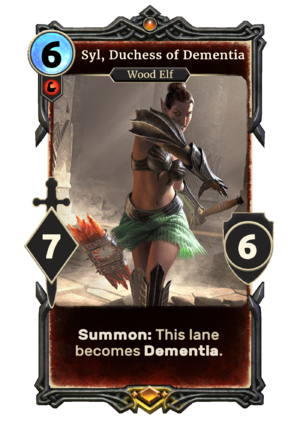 Syl, Duchess of Dementia is a unique legendary Strength creature card. It is part of the Isle of Madness story set. "None of them can be trusted! Do you hear me?" "They'll never take me down! Never!" Dementia is a special lane that remain even after the Syl leaves play. Dementia is in addition to the Shadow Lane, but replaces any other special lane rules. Lady Syl previously appeared in the Shivering Isles expansion for Oblivion. She is depicted in this card in her battle outfit, wearing Dark Seducer armor and weilding the hammer Nerveshatter. This page was last modified on 25 March 2019, at 11:43.